Navigate these pros and cons so that you can make an informed decision about your rural dream. Running contrary to the high rates of urbanisation in most developing countries as poor rural people gravitate towards the cities, one of the biggest global property trends to emerge in recent years has been the relocation of relatively wealthy city dwellers ‘back to the country’, in search of a less frenetic, more holistic way of life. To begin with, those in search of the pastoral idyll were often content just to acquire a weekend or holiday bolt hole in country or seaside villages not too far from their permanent residences, and in SA many destinations such as Dullstroom, Clarens, Langebaan, Greyton and Arniston continue to be the beneficiaries of such investment and part-time patronage. Next, worried about the crime rates in bigger centres and the difficulties of raising children there, city dwellers began to relocate permanently to security estates established on the city margins or, better still, close to smaller towns that promised an ‘old-fashioned lifestyle’ for families while their breadwinners continued to commute to their city jobs. Towns such as Somerset West, George and White River, all of which are close to large airports, and areas such as Mount Edgecombe ,close to the new international airport in KwaZulu-Natal, have all grown as a result of this increased interest. However, traffic being what it is, and with the costs of travel by road or air continuing to rise steeply, it was never going to take long for the commuters to contemplate the alternative of making a living in the country as well as living there – and that immediately boosted the popularity of ‘working’ estates, where owners share in the profits of growing olives, making wine or raising game while running their own businesses from home and travelling very seldom. 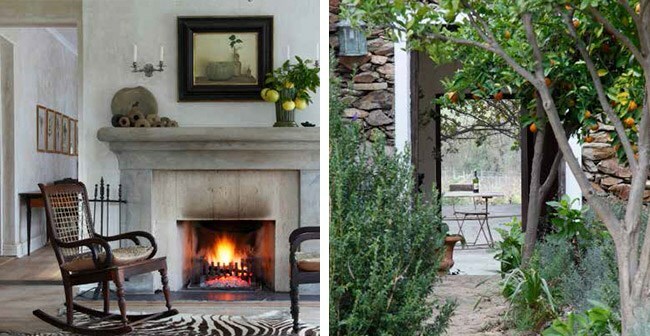 Such estates are found in abundance around Boland towns such as Franschhoek, Paarl and Wellington, but also in other locations as varied as Irene and Hazeldean on the outskirts of Pretoria, the Waterberg area of Limpopo, the Highlands area of Mpumalanga and the interior of the Eastern Cape. However, the homes in these estates are not affordable for many prospective country dwellers and now, further enabled by technology and fuelled by ‘green’ ideals and thoughts of self-sufficiency, the ‘semigration’ trend is increasingly running towards ‘real’ country living, where those relocating shed any and all ties to their old city jobs, homes and pastimes. The most popular option for such property buyers is to acquire a plot, smallholding or even a small farm where it is possible to grow their own food and perhaps a cash crop, and keep their own horses and cows while also accommodating an income- generating and hopefully employment- creating enterprise. The Midlands area of KZN is a perfect example of a place where this is happening on a large scale. The second most popular choice for relocating ‘townies’ is to buy a home plus an established local business (such as a bakery, butchery, hairdressing salon or garage) in a small town, or to buy or set up a B&B or guest house, especially if the location is picturesque and attractive to tourists. But like most major lifestyle changes, a move to the country lock, stock and barrel should not be undertaken without careful thought, research and preparation, and the help of knowledgeable and reputable local estate agents. Remember, this is supposed to be the best thing you can do for your family, not something that will put your financial future at risk. Don’t decide to do it because the countryside looked so lovely while you were there on your summer holiday. Visit your preferred area again in winter or the ‘off season’ to be sure you really like it. Be honest with yourself about what you are looking for by moving to the countryside. Is it a change of pace? Retirement? Following a dream? And don’t assume that the move will change your basic character or likes and dislikes. If you hate hard physical work in the city, you might still hate it in the country. And if you like interacting with lots of people, you will still like it – and may miss it terribly – in the country. Don’t assume that things are done the same in the country; they’re not. Just imagine that you’re moving to a foreign country and plan accordingly – expect to find different language use, customs, food, habits and sense of time. Make sure you and your family can cope if necessary with isolation, loneliness and separation from old friends, not to mention different weather, a lack of entertainment- on-tap, and plenty of hard work. Make sure you know what sort of property is on offer – and be specific about what you want. Is living out of town and really off the beaten track what you want? Or do you need, at the very least, a few shops and a good school within five minutes’ drive? Check on the water supply. You can’t run a household or business properly or grow anything without a reliable and plentiful supply of water, whether it comes from a stream or river bordering the property, a borehole or two, or from rainwater tanks. A bonus is a grey-water recycling system. On the other hand, be wary of flat land close to streams and rivers, as it may be prone to flooding. Consider whether the property is secure and safe for your family. Many people believe the most secure country homes are those visible (if set back) from a well-travelled road, and within sight of their neighbours. You should also find out whether there is a local block watch or security company in operation. If you believe you will have to install additional security provisions, you should build the cost of these into your calculations before making an offer to purchase. Educate yourself about the threat of fire to country properties and find out what fire-fighting services operate in the area, what precautions you should take and what equipment you may need to protect your family and animals. Consider the state of the roads giving access to the property. If they are in bad condition you will incur more wear and tear to your vehicles, and they may not be passable at all in bad weather. Bridges and fords should also be in good repair, as you could be cut off if these collapse or get washed away. Find out what schooling is available close by. One of the biggest reasons people give for moving to the country is so that their children will have a better quality of life – and part of this is a first-class education in an excellent school close to home. What profit does it make each month after all costs? This must be sufficient for your living expenses, savings and the monthly bond repayment on the property, which will obviously be smaller if you pay a deposit. You should also find out if there are quiet months for which you need to make provision in advance. How should I buy the property – in a company or privately? You will need to consult with a tax expert on the best option for your personal circumstances. Is the property correctly zoned for guest house or B&B use and/or are there any restrictions on the title deed that could affect the business? Are the financial records in order? There should be a due diligence clause built into your offer to purchase so that you can get all the documentation you need to make sure that the business and property are what you expect. The usual period allowed for due diligence is about two weeks and you should ask for three years’ worth of financial records, which you should then go over with your own accountant. Exactly what moveable property (such as furniture, curtains, appliances, aircons and TVs) is included in the sale? You and the seller should draw up and sign a precise inventory, down to the last kettle and pool cleaner. Will the existing staff stay on and have they been paid all the benefits that are due to them to date (such as leave pay and pension contributions)? You will need to renegotiate all employment contracts and service provider agreements when you take over. When did you move to Kalmoesfontein? We arrived four years ago. My husband is a winemaker [Adie Badenhorst of AA Badenhorst Family Wines] and fell in love with the area when he visited once to buy grapes for the estate he was making wine for at the time. We were yearning for old- fashioned, hands-on winemaking (he stomps his grapes like his grandfather did) and the farm was affordable. We could buy 60 hectares planted with old vines for the price of a flat in Cape Town! 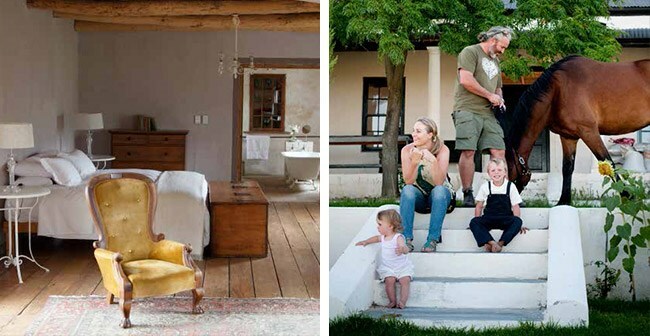 We both grew up on farms – but in Constantia and Stellenbosch, which are not as remote as the Paardeberg. But the sense of freedom here (no rules yet – this is cowboy country) appealed to us both. How do you juggle the role of being a stylist-in-demand and mother of two, never mind the family business of winemaking? At the beginning I did struggle with feeling cut off, but this was combined with becoming a mother of two – and in hindsight, it was a blessing in disguise because I was able to focus on them. But life constantly evolves, it transforms, and new opportunities arise. The internet, blog world, iPhone, Facebook and YouTube have made all the difference. Cape Town book club friends keep in touch and others come to rent out our cottage (through Perfect Hideaways, perfecthideaways.co.za), and the wine business is very sociable. Friends know they have to drive a bit further, so make a plan to spend time once they arrive … and sleep over. How does your perspective change? Visits to the city are more focused and you appreciate it more – bookshops, coffee shops, beautiful stores. And when you get home, you appreciate the farm more – the vegetable garden, chickens, ducks and horses. And you realise your kids have no physical boundaries; they have freedom. You come back to the farmworker’s life philosophy, the dust. But the dust can also be reality check. If it doesn’t rain, you become acutely aware of nature’s cycle. Sometimes that reality is hard. Sun is hotter, brighter, fiercer out here. And everything is further: you drive more or you have to plan better. I have made new country friends here: one rescues horses; another makes clothes in an old shed but used to work for Alexander McQueen; one has a funky restaurant that shows movies and does dinner on Thursdays; and one is just a cyber-junky who finds rent cheap out here. There is no good coffee in the Platteland, so if you can’t handle that, don’t do it! But moving, as I understand it these days, happens when the penny drops that you should be able to depend on yourself for a living. The absolute quietness is something you come to crave later. At first, hearing yourself think is a bit disturbing – too loud – but it soon becomes soothing. After a day in the city, it’s the country’s calmness that settles me.